� Exclusive FFA convention performance by country music star and FFA alumnus Easton Corbin of brand new song "Farmer in All of Us," inspired by Paul Harvey's iconic speech "So God Made a Farmer"
The Ram Truck brand headed to Indianapolis, Indiana, for the 91st National FFA Convention & Expo with activities designed to commemorate and celebrate the fifth anniversary of the renowned Ram commercial "Farmer." Going beyond exhibit space, this year's Ram Truck presence at the FFA convention featured an exclusive live performance by country recording artist, Easton Corbin and the recognition of three finalists of the "The Farmer in All of Us" program, a nationwide social initiative that allowed current FFA members and alumni to nominate and recognize those farmers who have made an impact in their agriculture communities. 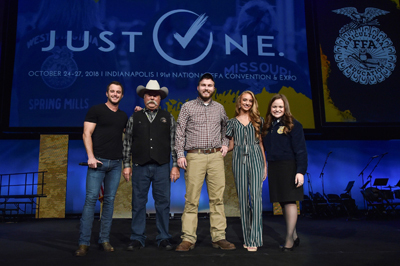 "The Ram Truck brand has been an active supporter of the National FFA Organization for more than 60 years, but in the last five years since the premier of 'Farmer,' the connection with the FFA and farming communities across the nation has grown even stronger," said Reid Bigland, Head of Ram Brand. "It is a great pleasure to be among thousands of FFA members, celebrating and honoring deserving individuals for their commitment to agriculture, work ethic, integrity and tenacity." 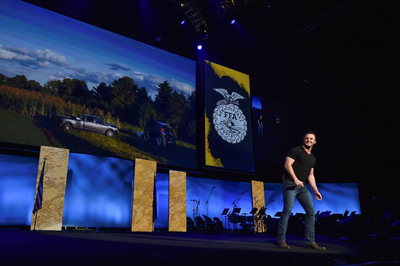 Attended by current and future farmers, National FFA Organization members were treated to a live performance by country music recording artist and FFA alumnus, Easton Corbin. Corbin took the stage to perform "Farmer in All of Us," developed with Universal Music Group Publishing in Nashville in collaboration with the Ram brand. The song is inspired by the powerful stirring "So God Made a Farmer" tribute delivered by legendary radio broadcaster Paul Harvey. The video for "Farmer in All of Us" can be found on the Ram Truck brand's official YouTube channel. The Ram brand's commitment to agriculture continues to grow with several opportunities and initiatives to support the efforts of the nation's farmers. From the launch of dedicated Harvest Edition trucks, to the offering of unique dealer incentives for farm-owning customers of the Ram Truck lineup, and through Ram's relationships with many diverse agriculture brands, customers can take advantage of additional incentives and discounts on purchases, worth thousands of dollars, of farm and ranch equipment and management tools. Information on the many Ram Truck brand's agricultural activities and programs can be found at the RAM life website.